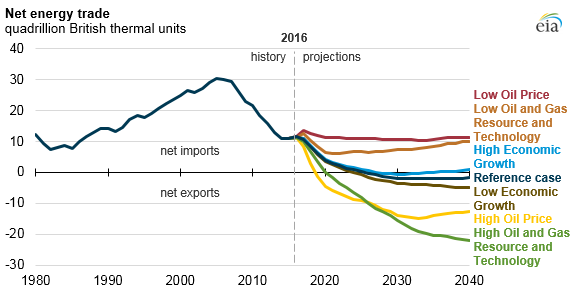 EIA’s Annual Energy Outlook 2017 (AEO2017), released this morning presents updated projections for U.S. energy markets. This AEO is the first to have projections through 2050 in the AEO tables. Energy consumption is consistent across all AEO cases, bounded by the High and Low Economic Growth cases. In the Reference case, total energy consumption increases 5% between 2016 and 2040. Because a significant portion of energy consumption is related to economic activity, energy consumption is projected to increase by approximately 11% from 2016 to 2040 in the High Economic Growth case and remain nearly flat in the Low Economic Growth Case. In all AEO cases, the electric power sector remains the largest consumer of primary energy. Energy production ranges from nearly flat in the Low Oil and Gas Resource and Technology case to growth of nearly 50% over 2016–40 in the High Oil and Gas Resource and Technology Case. Unlike energy consumption, which varies less across AEO cases, projections of energy production vary widely. Production growth is dependent on technology, resource, and market conditions. Total energy production increases by more than 20% in the Reference case from 2016 through 2040, led by increases in crude oil and natural gas production. Energy related carbon dioxide emissions decline in most AEO cases, with the highest emissions projected in the No Clean Power Plan case. All AEO2017 cases except the No Clean Power Plan case assume the Clean Power Plan is implemented. In years between the full editions, a shorter edition provides a smaller number of cases summarized in annotated presentation slides with the standard set of AEO browser tables and spreadsheets containing the detailed modeling results. EIA will continue to update and refine the market dynamics and technologies in future AEOs, especially for the projections between 2040 and 2050. Projections from the AEO2017 Reference and alternative cases are available on the Annual Energy Outlook website.